'The Real Housewives of Beverly Hills' season 7 is in full swing as Kyle reflects on her experiences. If you ever wondered what it was like to be in a reality star, Kyle Richards of 'The Real Housewives of Beverly Hills' has a pretty good explanation. Watching re-runs of the episodes to her feels less like watching a TV show, and more like immersing herself in home movies. It can't possibly be an easy ride getting to star as a 'Real Housewife'. With all the drama, fights, betrayal and breakdowns, it makes you wonder what on earth these women can possibly see in it - let alone how they can tolerate people that are often consistently so unreliable and selfish. Kim Richards' 'Real Housewives' co-stars have publically shown their support via social media. Lisa Rinna, Lisa Vanderpump, Eileen Davidson and Brandi Glanville have all commented on Richards' arrest for public intoxication. Kim Richards' co-stars on The Real Housewives of Beverly Hills have shown their support for the former child star on social media. Richards was arrested in the early hours of Thursday morning (26th April) and charged with public intoxication. Richards has had difficulties with alcoholism in the past and, in the light of her recent arrest, it appears she may have fallen off the wagon. Kim Richards' Real Housewives co-stars have responded to her arrest on Twitter. Read More: Kim Richards Reportedly Arrested For Drunkenness & Kicking A Police Officer. Taylor Armstrong, the former star of 'The Real Housewives of Beverly Hills', has wed John Bluher in Los Angeles on Friday (4th April). The couple have been dating since 2012 and celebrated their nuptials with 120 guests. Taylor Armstrong, the reality star best known for appearing on The Real Housewives of Beverly Hills tied the knot with John Bluher on Friday (4th April). Taylor Armstrong and John Bluher married on Friday! 42-year-old Armstrong, who starred between 2010 and 2013 on The Real Housewives of Beverly Hills, married her fiancé John Bluher in a lavish L.A. ceremony. This is Armstrong's second marriage as she was previously wed to Russell Armstrong between 2005 and 2011. A string of reality stars showed up on the blue carpet for the Bravo Upfront presentation in New York City including 'The Real Housewives of Beverly Hills' stars Brandi Glanville and Lisa Vanderpump. Kyle Richards from the 'Real Housewives of Beverly Hills' looks stunning in a short, black and white summer dress teamed with some black and gold wedge heels, but her dignity and grace are almost lost as an unfortunate gust of wind almost blows her dress up on several occasions while she chatted to photographers about the opening of her new clothing store the next day. Thankfully, her young daughter Portia was quick to prevent a wardrobe malfunction and continued to keep a watchful eye on her mother's dress while they walked away. Richards reveals that she is 'so excited' about the opening party and explains that she's on her way to the store to make final checks that the clothes are getting in and that the mannequins are clothed. 'Real Housewives of Beverly Hills' star Kyle Richards stands outside her brand new women's clothing store amongst her friends hand in hand with her 4-year-old daughter Portia Umansky. She tells approaching photographers that the store will be open in two days but she hints that she's worried things won't be ready in time. She's asked what sort of clothes she'll be selling. 'Beautiful clothes, accessories, jewellery, handbags, you name it!' She says with zeal before setting off to get cupcakes with her friends. 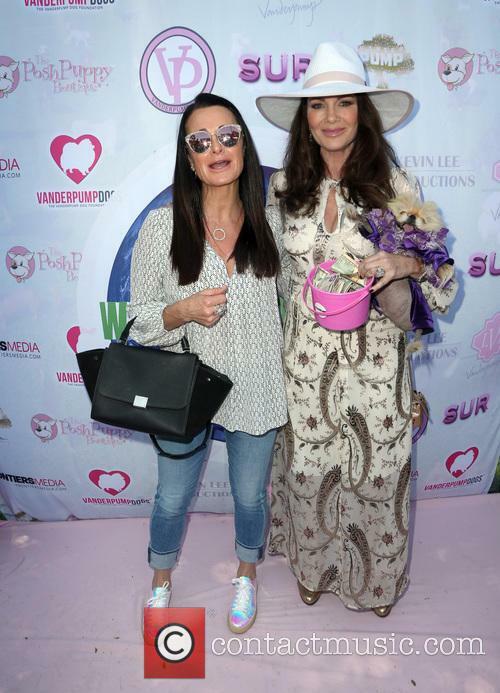 Reality TV star Kyle Richards has lunch with friends in Beverly Hills. The Real Housewives of Beverly Hills star is seen with a hot drink, checking her phone. Later, as she is walking down the street with her friends, she admits to not knowing who is playing in this year's Super Bowl. After the photographers tell her to support the New York Giants, she reveals that she supports whoever her husband supports. Reality TV star Kyle Richards (Real Housewives of Beverly Hills) is seen entering a nail salon in Beverly Hills with her daughters. When asked what colour her nails are going to be, she replies 'Pink!' As they leave the salon, Kyle stops to have her picture taken with a fan. She asks photographers where the nearest ATM is, so she can withdraw some money. Her niece, Paris Hilton, is spotted down the road, entering a building. Upon returning to Kyle, they tell her about seeing Paris. Kyle replies that she has been trying to look for her. When Paris pulls up in her car, she has a conversation with Kyle about a Halloween costume party they will be attending. Stars of the hit reality show 'The Real Housewives of Beverly Hills' Kyle Richards and Lisa Vanderpump meet up with TV personality Holly Robinson Peete while out and about in Beverly Hills. Lisa warns the photographers to be careful when crossing the road before introducing herself to Holly. Kyle Richards, the star of 'The Real Housewives of Beverly Hills', shopping for shoes at Fred Segal's in Los Angeles. Wearing a bright green flowing dress, Richards chatted with reporters about fashion and her buying habits. When quizzed on her most expensive pair of shoes, Richards said, "Are you kidding me.I can't say that." The reality star refused to give an exact figure but revealed the shoes were designed by Christian Louboutin. She later claimed her husband makes the money and she "spends it"